Mr. Ashok Medhi of Tihu, Nalbari district, Assam, a class IX student first came to know about vermicomposting through an agriculture-based local radio programme ‘Krishi Jagat’. He was quite overwhelmed by the fact that earthworms could be used to increase the fertility of soil. He decided to try vermicomposting on his own. He borrowed a sum of Rs. 6500 from his father and constructed 3 tanks and started making vermicompost. He continued this for about one and half years but could not profit from the venture, hence he decided to leave it. In the meantime, he came in contact with officials from KVK, Nalbari district and District Agriculture Office, Nalbari. 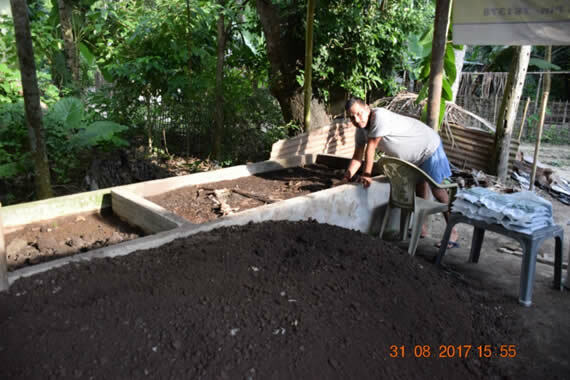 With their technical guidance, Mr. Medhi started a new vermicomposting unit comprising of 7 tanks and obtained good results. At first he sold his product in 5kg packets @ Rs 5.00/kg through nearby shops and also sold his produce in the capital city Guwahati. He started earning good profit from his vermicompost unit. At present apart from having the 7 tanks he is also managing 70 nos. of plastic beds of vermicompost covering 4700 sq. meters. He gets a total of 300 tonnes of vermicompost per year which earns him an annual profit of around Rs. 7 lakhs. He is presently leading a comfortable life supporting his family very well. Besides, a group of youths are also employed in the unit. This all became possible because of his enthusiasm that he showed at a very early age of his life.